Rooster koek is a traditional South African bread which is cooked over a braai and served with a variety of fillings and toppings. This version was created using wholewheat flour and the new Flora vegan. Replacing refined carbohydrates like white flour with higher fibre, less refined carbohydrates like wholewheat flour is a great way to get more fibre into your diet, stay fuller for longer and prevent heart disease. 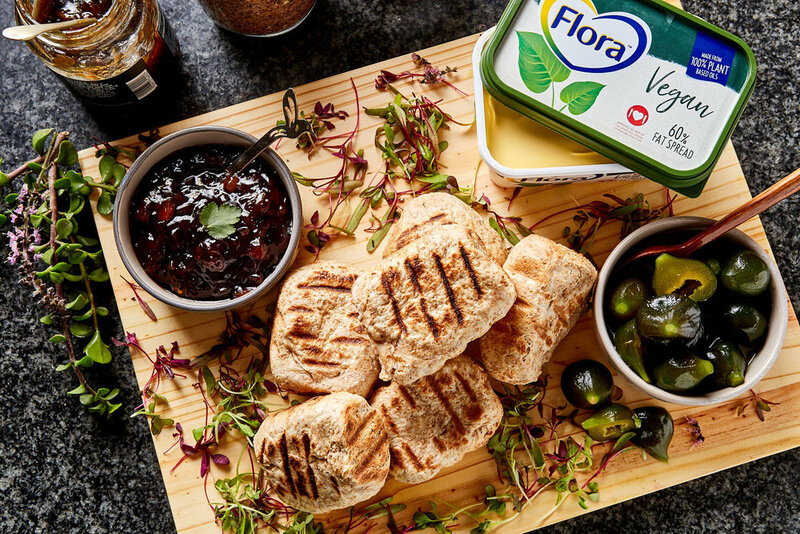 The Flora vegan adds some heart-healthy omega 3 fats and is a great replacement for the traditional butter that is often used in this dish. 1. In a large bowl, combine the flour, sugar and salt and sprinkle the yeast on top. 2. Add the water to form a stiff dough. Knead the dough until elastic. 3. Brush the dough with the margarine and cover. 4. Leave to rise in a warm place until doubled. 5. Knead down and shape into 12 equal sized balls. 6. Flatten the balls and braai over a slow fire until golden brown. 7. Serve with fillings of your choice.